It doesn’t matter if you’ve got tile, hardwood or marble, you’ll want to add a plus spot somewhere in the kitchen to keep those feet cozy. Near the island or the sink, place something plush under your toes where you do your most work and add some texture. 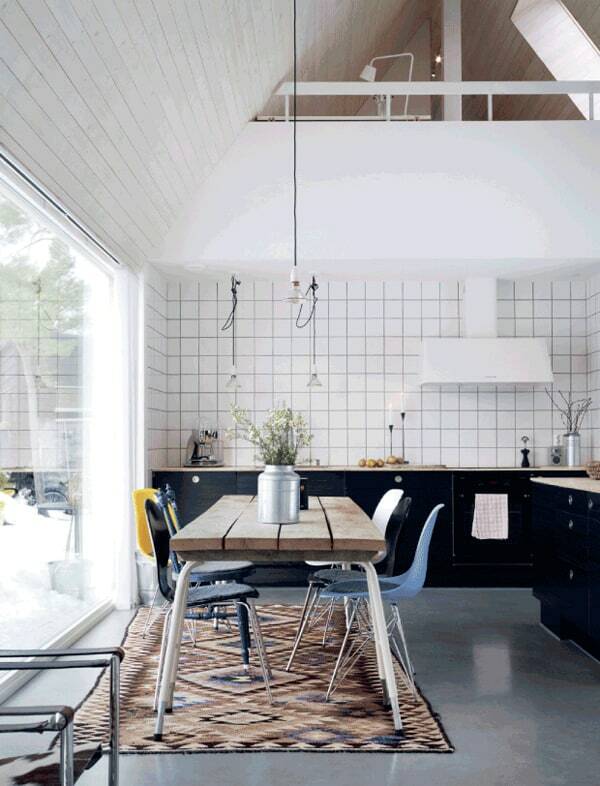 Create some extra comfort with these 40 kitchen rugs below! 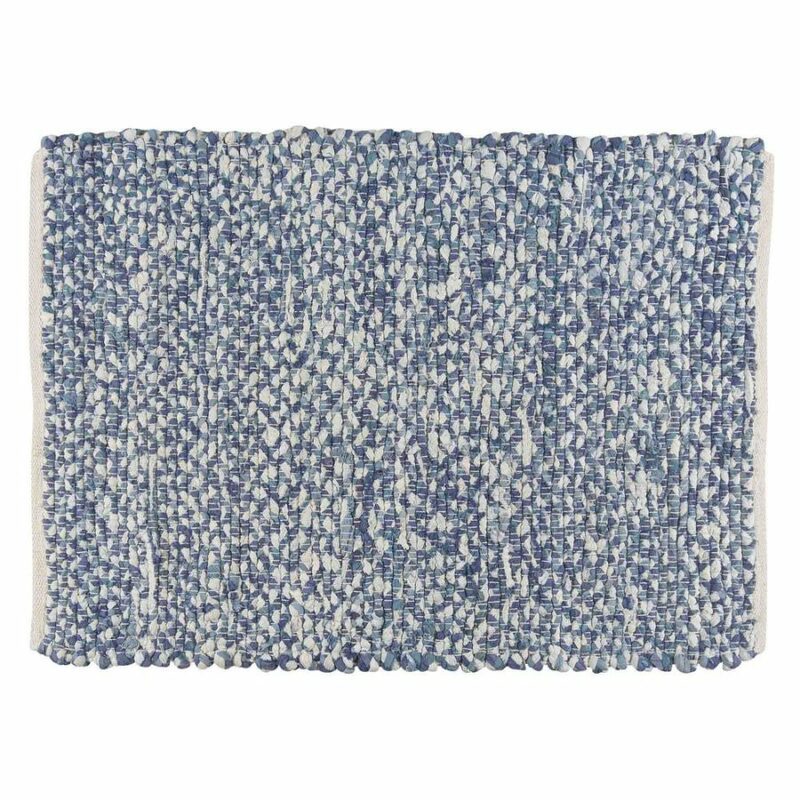 This recycled cotton Chindi rug is the perfect addition to your offbeat, eclectic kitchen. 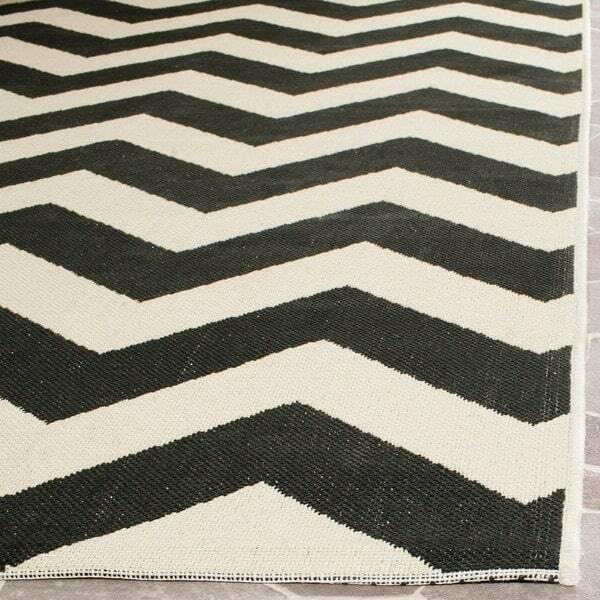 It adds color, texture and has a trendy, light chevron print woven throughout. And this particular design is only available at World Market. 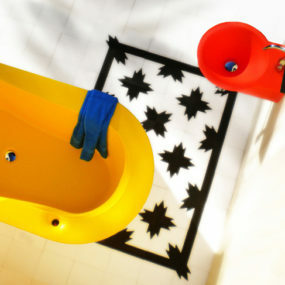 Here’s a great choice for slide next to the sink for an extra bit of cushion under your toes while you wash dishes. 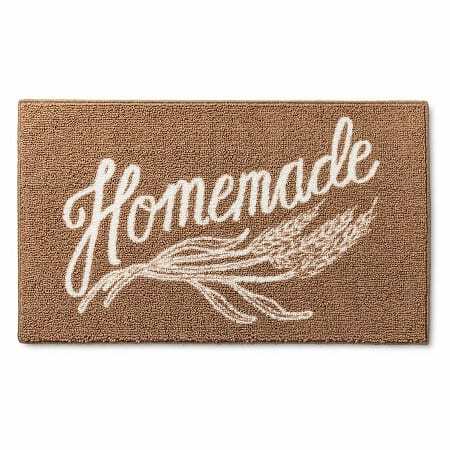 For a vintage, country vibe, this “homemade” mat from Target will fit seamlessly inside your farmhouse kitchen. It definitely adds the right amount of comfort to the space. If you want plush texture, then you’ll want to to check out this curly shag design. It’ll add a luxurious, yet relaxed flavor to your chic kitchen and maybe even a delicate, feminine touch too. 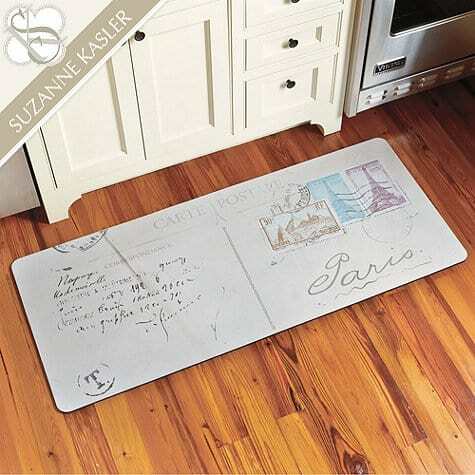 Place it near the island, making dinner prep more comfortable, or the walk way between the kitchen and breakfast nook. 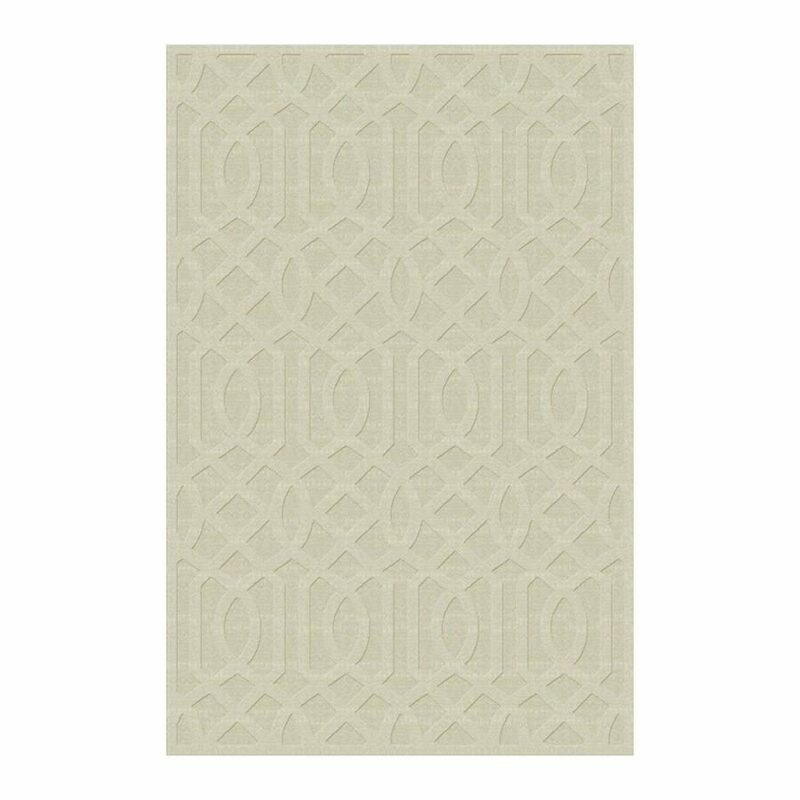 Another woven rug that’s versatile and will slide into all kinds of kitchens with ease, this Home Depot find is made of 100% cotton. 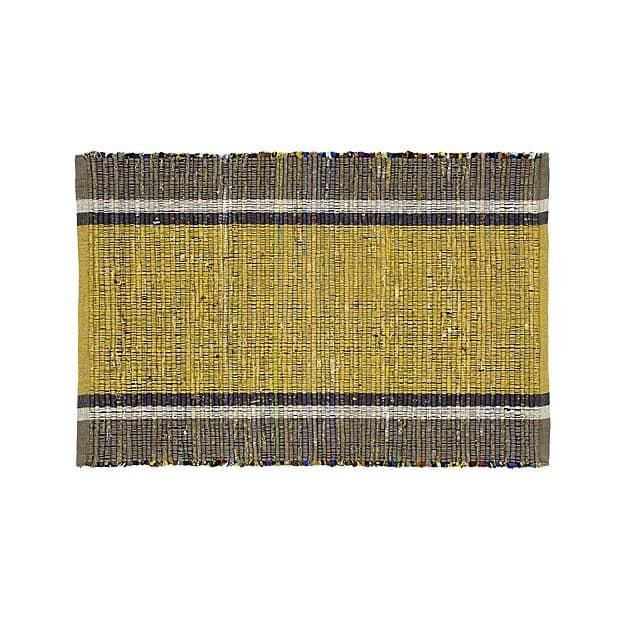 This is also a Chindi rug that’s been handwoven by artisans on a loom. 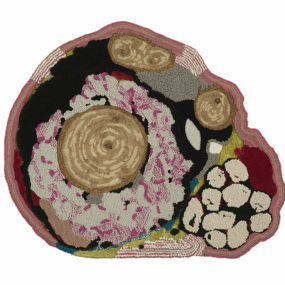 Each of these types of rugs is unique but also comfortable and welcoming for any space you put it in. Add some florals to the kitchen! It’s perfect for more traditional or cottage-styled spaces. And this particular design has a memory foam backing making it super soft under your feet while you’re standing cleaning the dishes or prepping for dinnertime. Trellis prints are trendy and blend throughout all kinds of home styles. 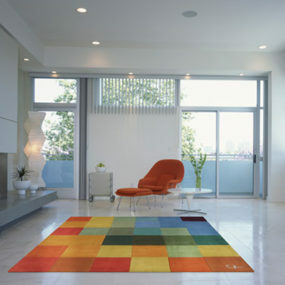 They always bode well with neutral tones but why not choose a rug with a pop of color to add personality? And this one is microfiber, a great piece when near water. 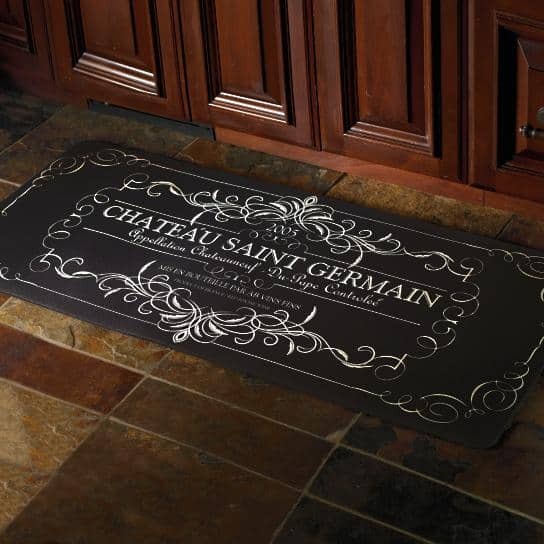 Add a bit of European flair to the kitchen with this bistro-inspired mat from Frontgate. It’s cushioned for comfort and it’s the perfect option for those with a love of wine. Thankfully, it’s a beautiful mix of both style and function. 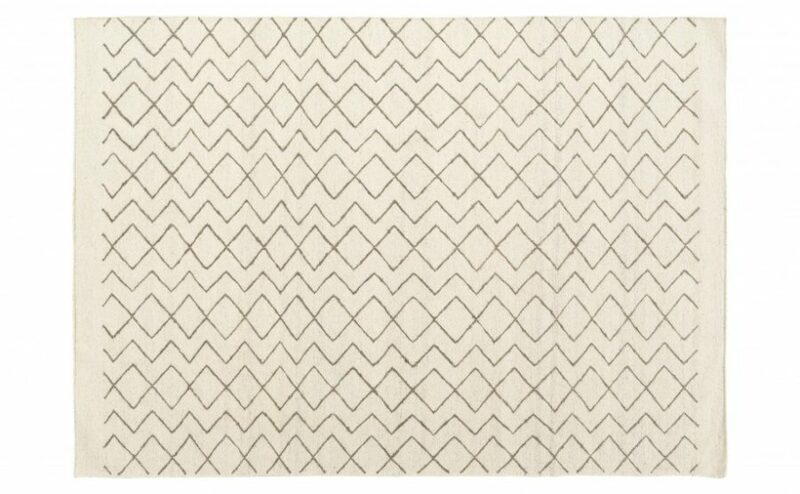 Check out this zigzag rug from Kirkland’s. We can easily imagine this design set inside a neutral, modern kitchen. The print makes it a trendy choice but it’s also one that’s become a timeless addition, you can’t go wrong with this one. A runner could be your best choice as well. 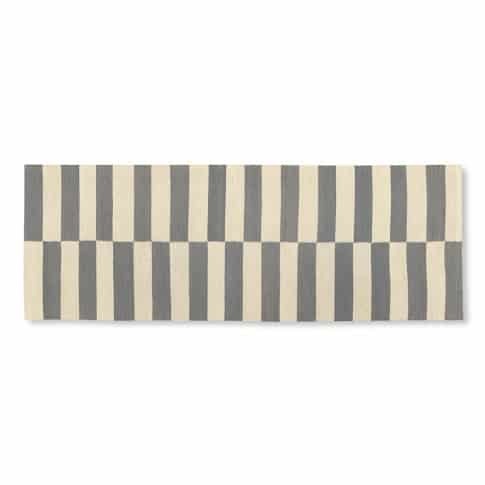 This striped gray rug from Williams Sonoma could be your answer to jazzing up the space between the kitchen island and the stove. It breaks up bouts of hardwood flooring or tile with comfort and personality. 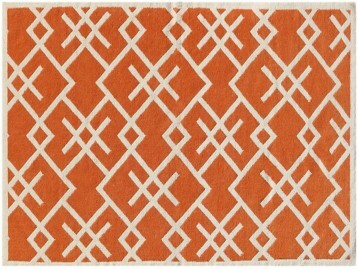 We like this cotton rug for our more industrial spaces. 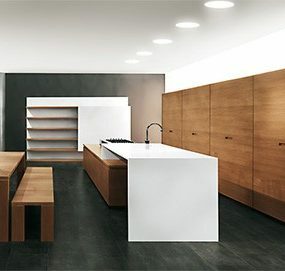 It’s got an easy, yet edgy, vibe as well as a certain bit of masculinity for those kitchens that are a bit darker and less delicate. 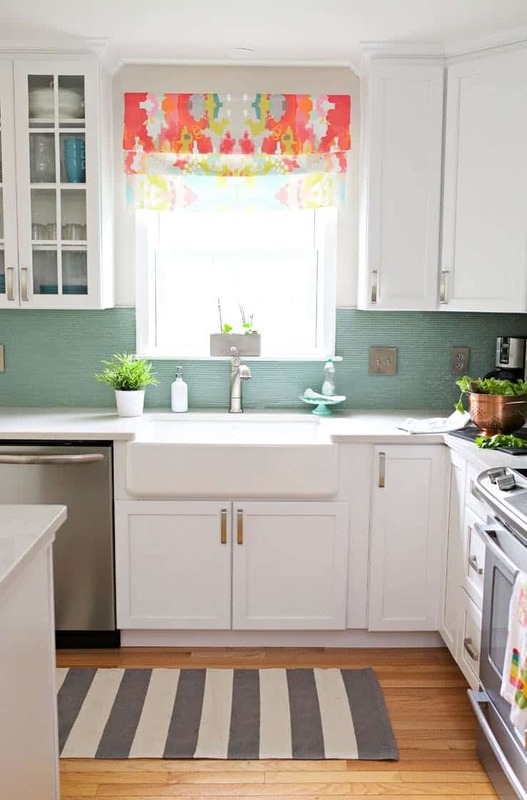 Rag rugs will never truly go out of style, and that goes double when it comes to the kitchen. 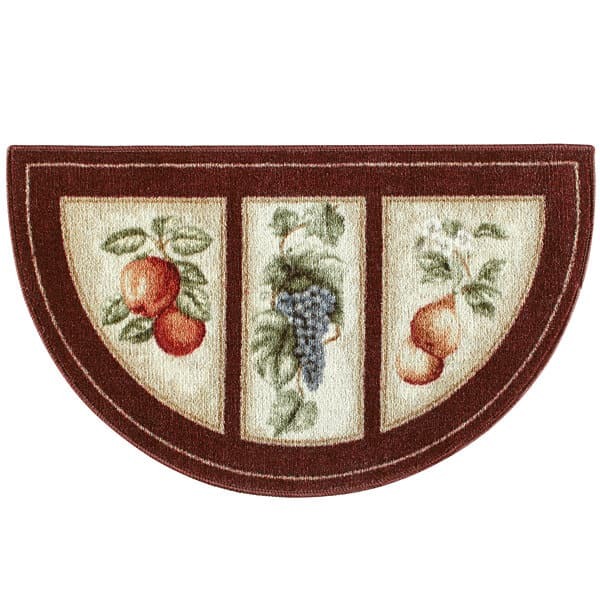 This fruit wedge rug is a more traditional choice. It’ll slip inside family homes making a warm and welcoming addition. Cottage, farmhouse, country and even some more rustic styles can welcome this design. 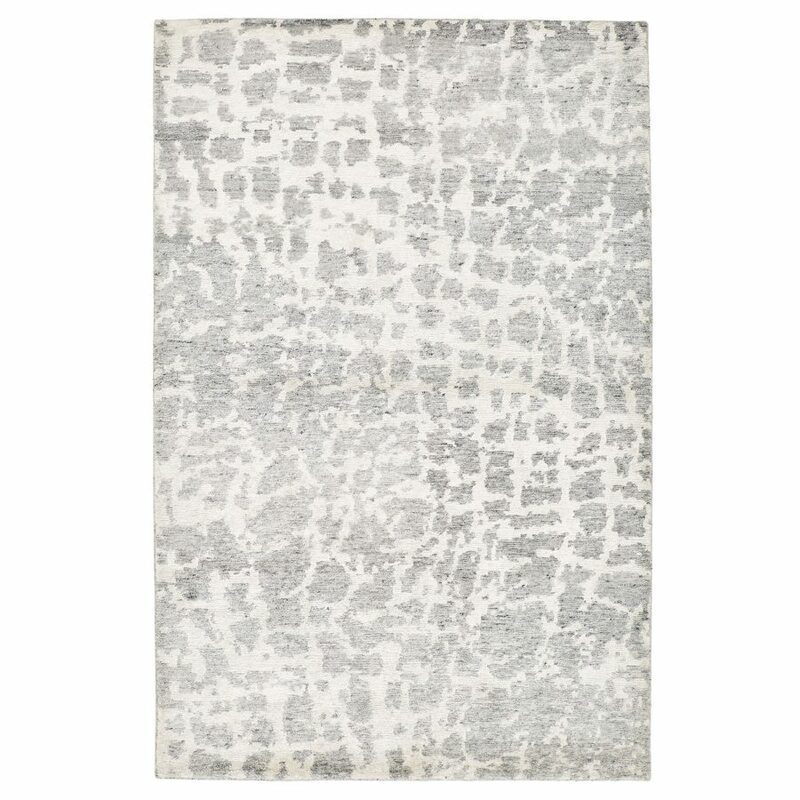 Black and cream with a texture and natural flair, this safavieh rug will help you make a statement. If you’re looking for something that creates a bolder, more contrasting style, then this is one to take a second look at. Thankfully, it’s also a versatile print and color pairing for various decor genres. The color trio is trending, gray, yellow and cream and the delicate print helps to add femininity and poise to the kitchen. It’s happy, it’s upbeat and even a good option for changing out designs for springtime. 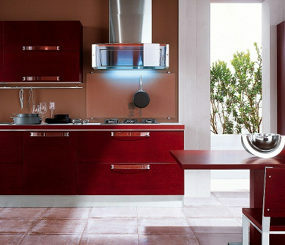 It’s also stain resistant making it the perfect choice for the kitchen. 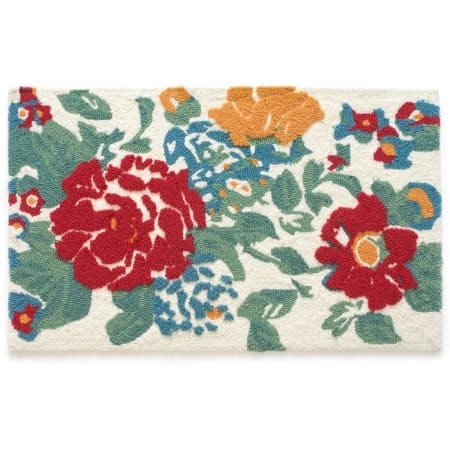 We have fallen in completely love with this floral Kashmir embroidered rug from World Market. 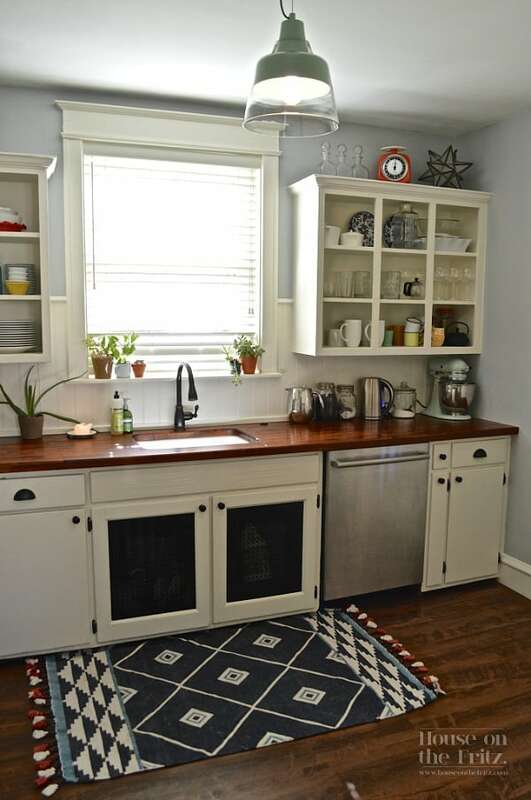 The intricate, folk-art inspired patterns make for a super fun addition to the kitchen. But also one that speaks of cultural uniqueness and interest. Here’s another more traditional pick when it comes to the kitchen. This will blend well with wooden cabinets and family-friendly styes. The braids help with comfort and you can get this particular design in a variety of subdued shades. 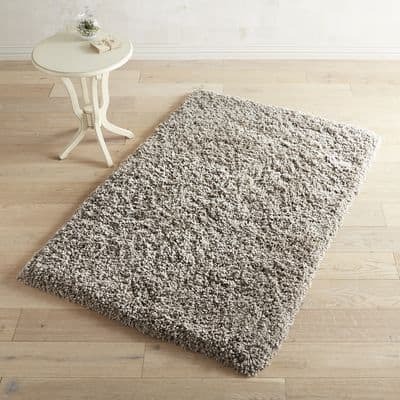 This tufted area rug is perfect for a space that has more room to entertain. Whether you place it inside your open kitchen or use it to fill the space between where you cook and where you eat, it’s quite the beauty. And it’s creamy tone go well with all kinds of styles. 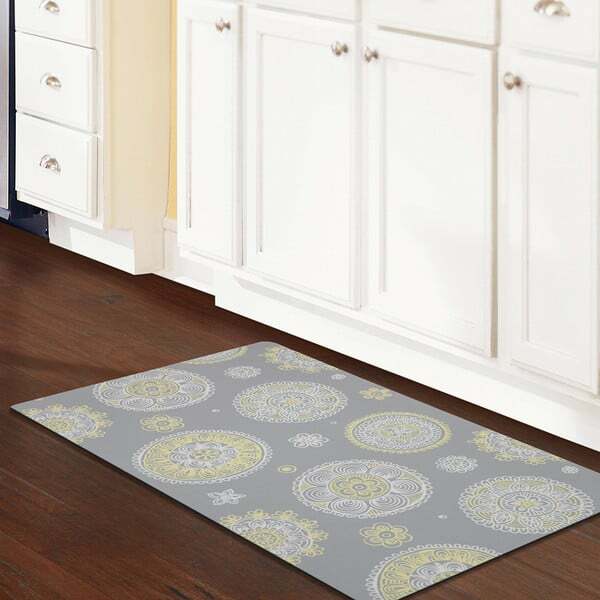 Here’s another mat that you can put in front of the sink or island to keep your feet comfy and cozy while you work. This time it’s got a vintage vibe with extra “postcard” pizzazz. 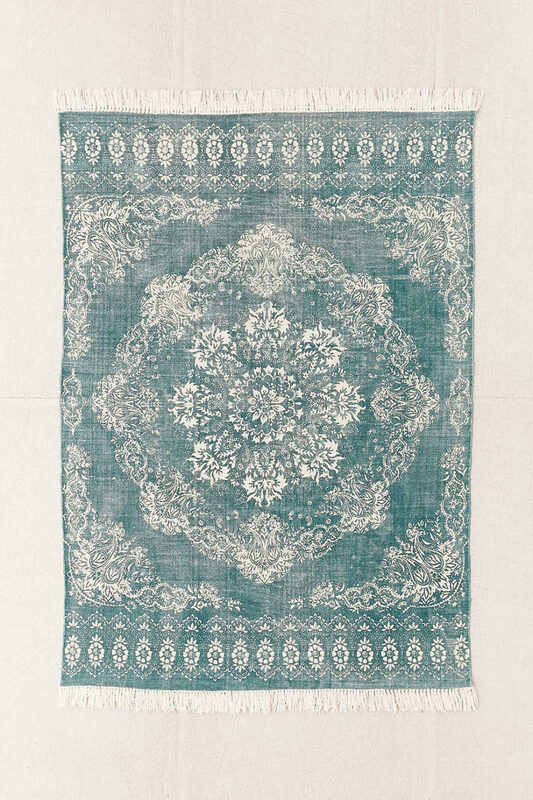 Place it inside your Victorian or cottage-inspired space. 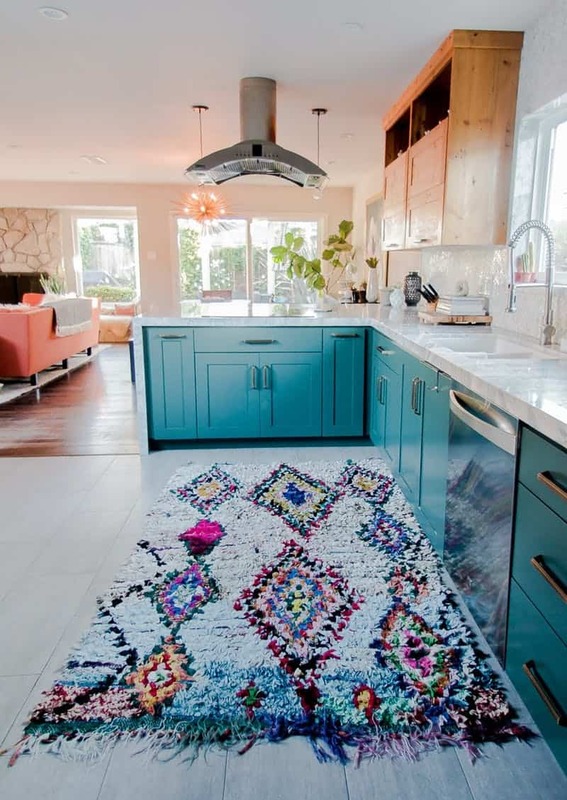 The Persian rug trend is on fire, and that includes inside the kitchen. We’re loving this fun prints and wild colors adding pop and personality inside your workspace! It really adds a new layer of style to the area. 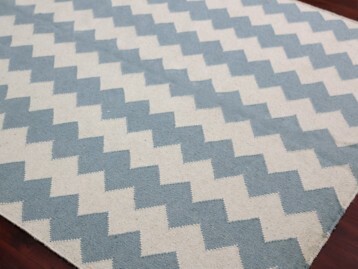 We’re loving this Cali woven rug from Urban Outfitters too. 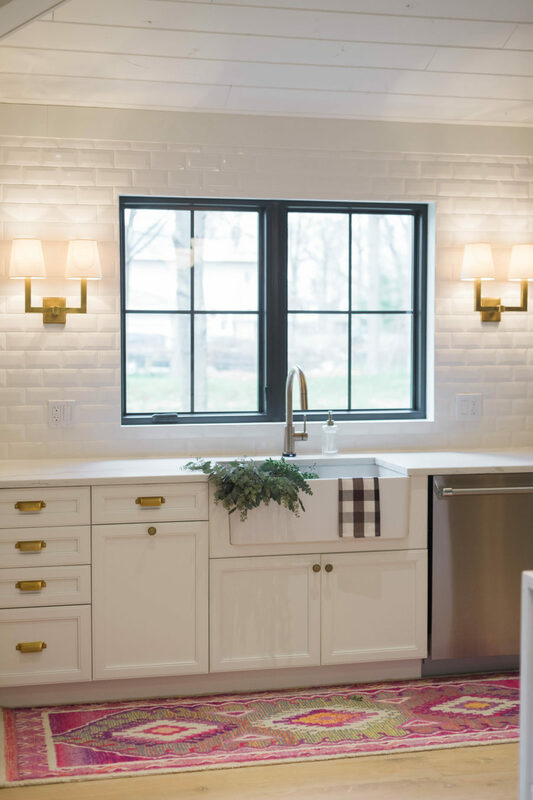 It’s subtle, romantic, fashion-forward and easily placed inside a light wood or white kitchen with all the eclectic odds and ends we’ve fallen for. 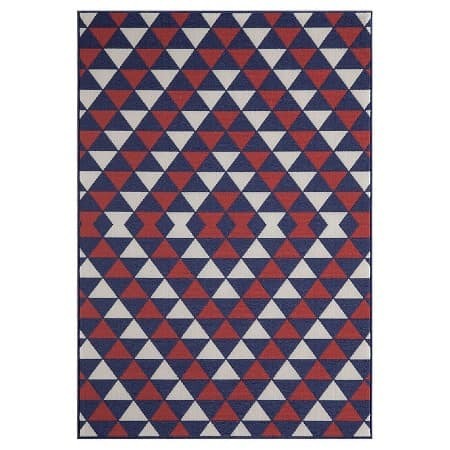 Made from wool and cotton, this geometric print can go from rustic to modern quite easily. 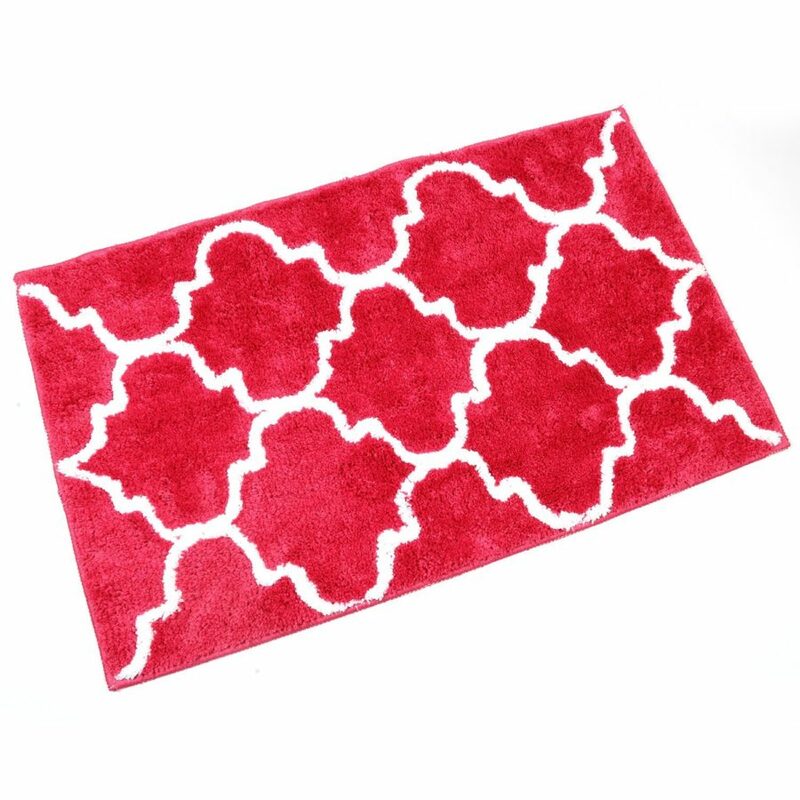 Why not add lots of pop to the kitchen with this Anguilla rug from Target? The red and navy print will definitely add interest to your space without getting too fussy on the counter tops. 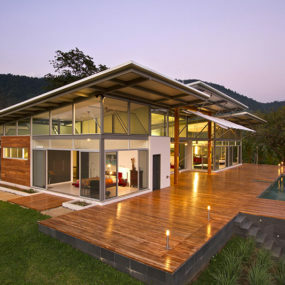 It’s also an indoor/outdoor design, making it weather-resistant, meaning resistant to all the spills in the kitchen. 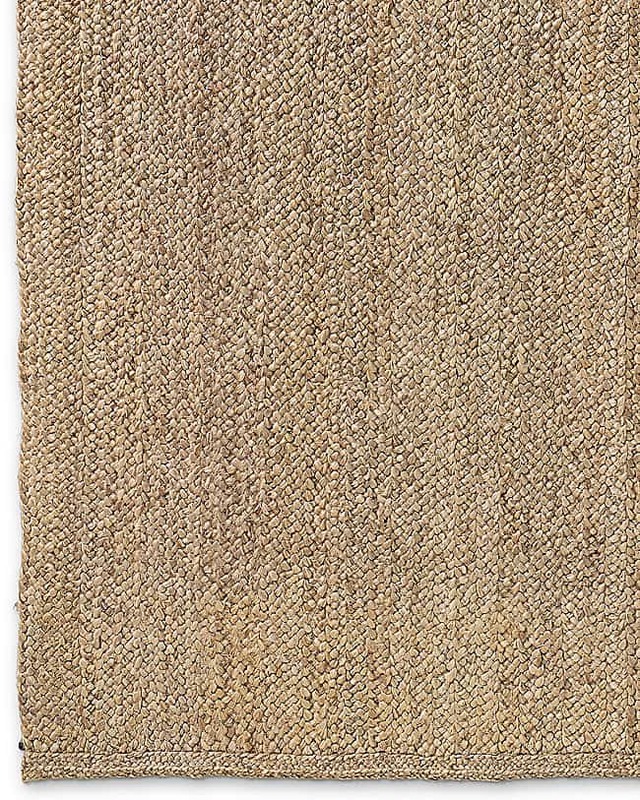 If you want something with a more natural look, then try out this jute rug from Restoration Hardware. We love its texture and, again, it will glide into any kind of space with ease. From farmhouse to vintage, it’ll fit right in. An orange surprise may be what you want to top off (or bottom off) your kitchen with. This crisscross print from Kirkland’s adds quite a bit of personality and seems to be a fitting choice to finish off this area of the house. Its warm tone will welcome everyone inside. 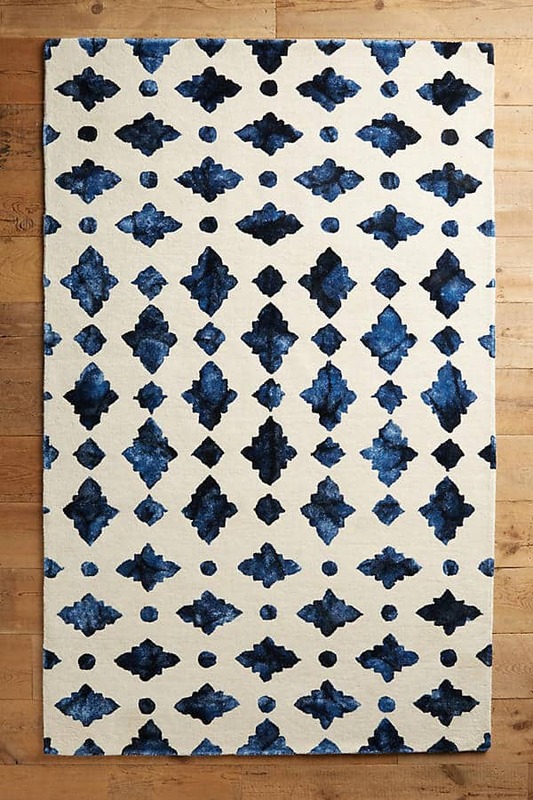 Made from a blend of cotton and wood, this sola rug from Jayson Home is a personality favorite. A subtle, yet trendy pattern, and neutral shades made it a romantic and easy choice. You just need a more open kitchen to make this one work. And now we have another braided style that we can sit fitting nicely inside a variety of kitchens. Its tone makes it elegant and chic, while its simplicity makes it a timeless style that will be able to stay even through changed to the interior. 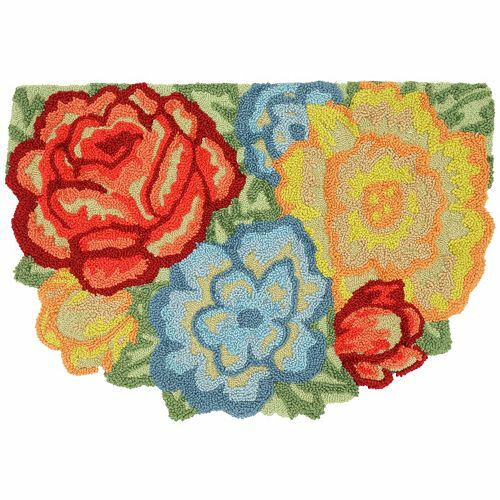 This country garden rug from Walmart is just another charming example of what you can include in your kitchen when transforming the space into something more traditional and cottage-esque in spirit. There’s a bit of color and a lot of comfort in this design. We’ve fallen upon another personal favorite from the bunch. This design we found over at Apartment Therapy is example what a dream kitchen is topped off with. 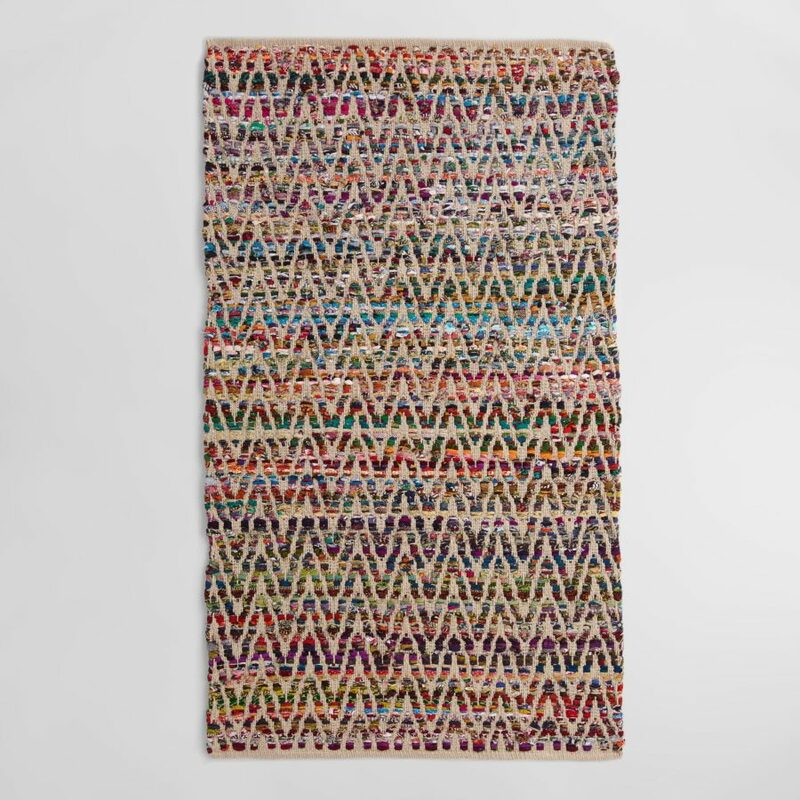 A watercolor-inspired aztec braided rug that feels soft and plush under your feet. This runner adds some color and unique texture to a space that’s not used to seeing either. 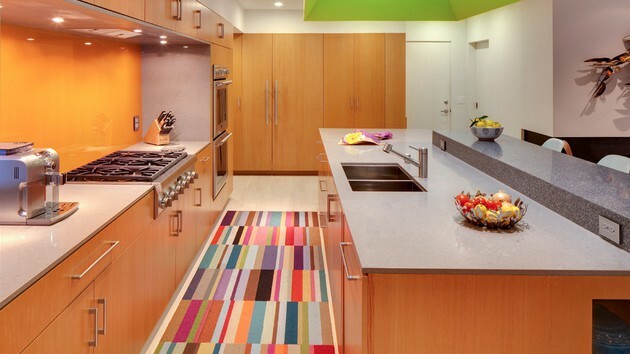 We love this gorgeous example of a clean, modern kitchen and the artistic quality a rug can bring inside. Whether blue, pink or purple, this trend works! If you want color but need to go with a more modern design, this multi-color block runner will do the trick. Keep this clean and sleek without straying away from personal touches. There’s so much personality and fun in this one! It’s hard not to fall in this with this Moroccan beauty from Anthropologie. This too needs a kitchen with more open space and flooring. That bit of blue inside a neutral room will do so much without becoming overboard. Here’s a beautiful example of how a simple, stripe runner can fit easily inside your kitchen and finish off its overall look. It’s both functional and on-trend. And breaks up hardwood floor providing interest. 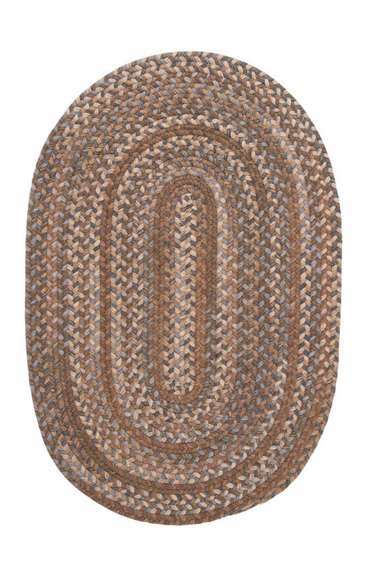 One of the most unique designs, this round, braided rug is everything inside of this space. Texture and eclecticism are two things that go hand-in-hand. Don’t be afraid to make a big statement in your kitchen like this one. 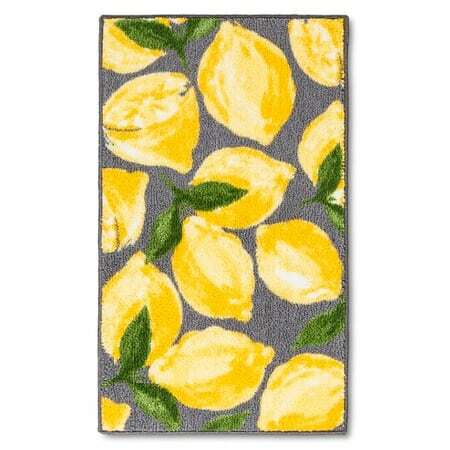 If you’re changing out mats and rugs for the changing of the seasons, add some lemons in there for spring or summer. You’ve got a pop of color, a nod to Mother Nature and comfort below your toes. And you can find this simple design from Target! 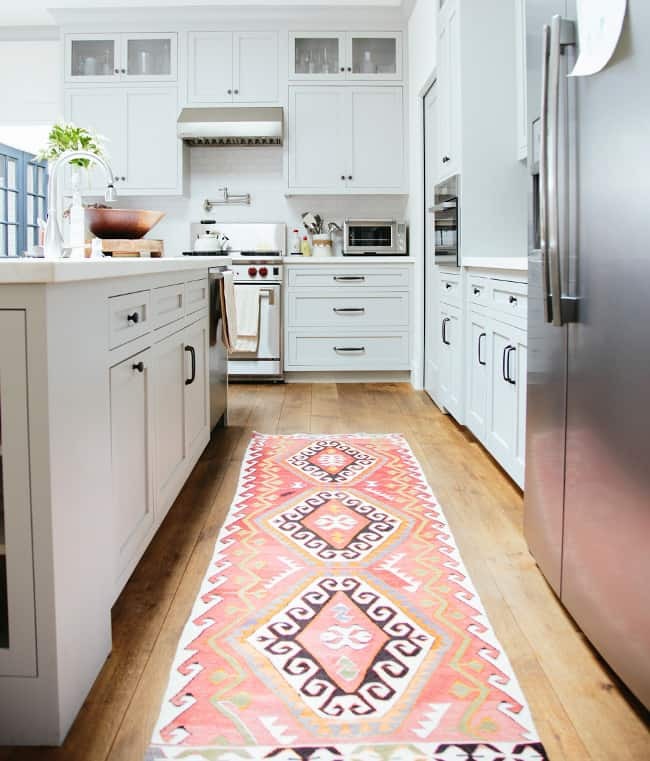 A colorful, Oriental rug you find on a random trip to a flea market could be your answer to your drab kitchen woes. 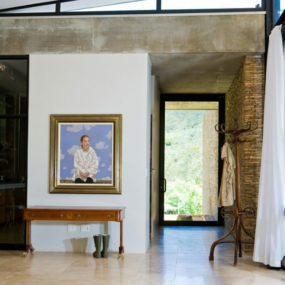 Again, here’s an example of how a unique rug can be placed inside a larger space and finish off the look with ease. 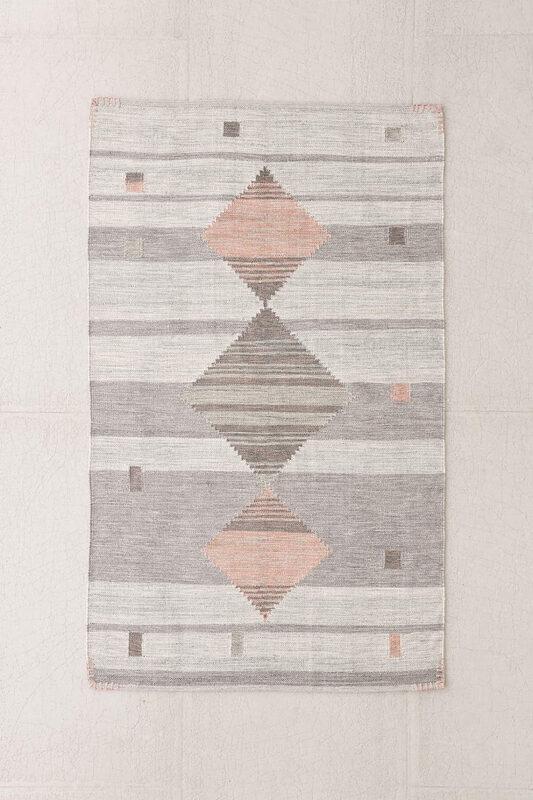 We’ve fallen in love with this neutral aztec rug too. If your kitchen table and kitchen workspace are two-in-one, break it up with some texture on the floor like you see here. You can see be modern, sleek and trendy by choosing the right design. 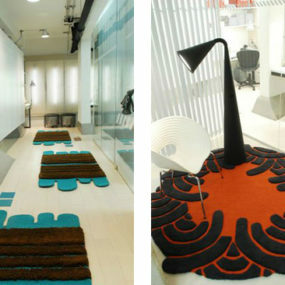 Abstract, neutral rugs are perfect choices too. We especially love this one because it’s romantic. But it’s also simplistic making it easier to blend with everything from vintage kitchens to more modern ones. But if you still want that an abstract look with color, you can find those kinds of designs too. 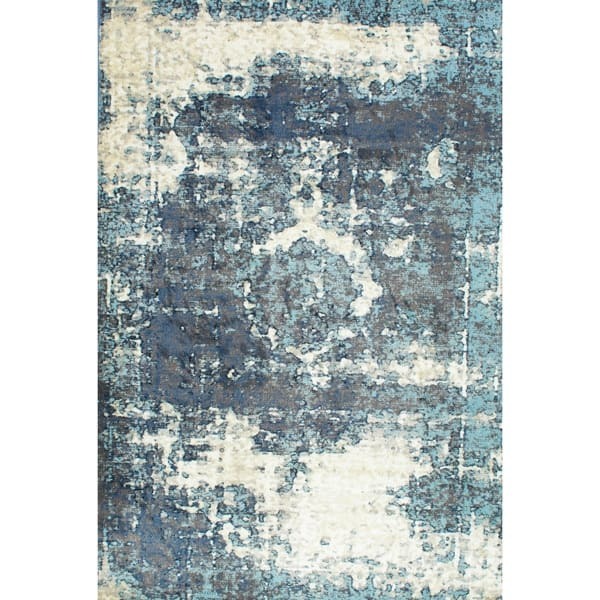 Just look at this fancy blue rug from Overstock! It’ll be like artwork for the floor. 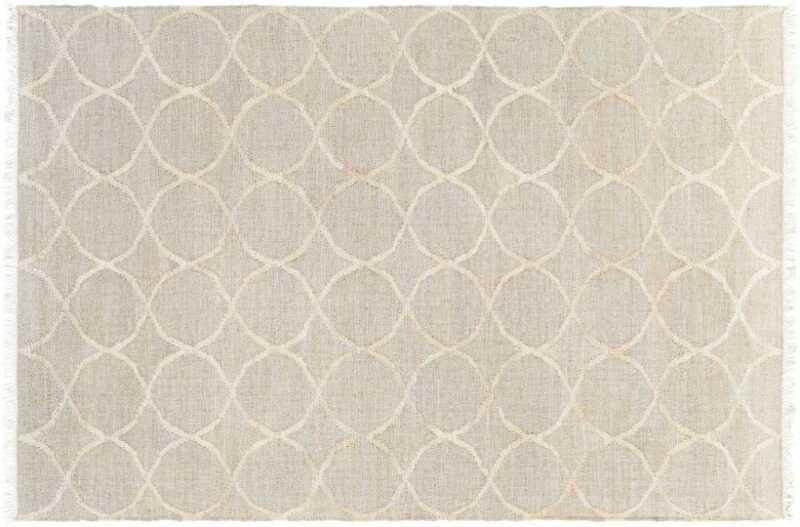 The Cella gray rug from Jayson Home can brighten up dark hardwood floors. 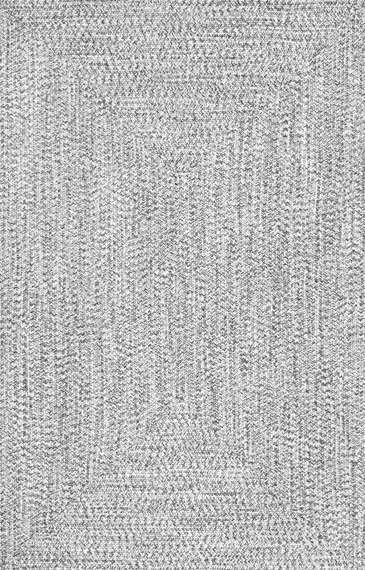 This design is made from jute, which is why it’s got that natural quality that’s so good for kitchens. And another fun fact, it’s also reversible. 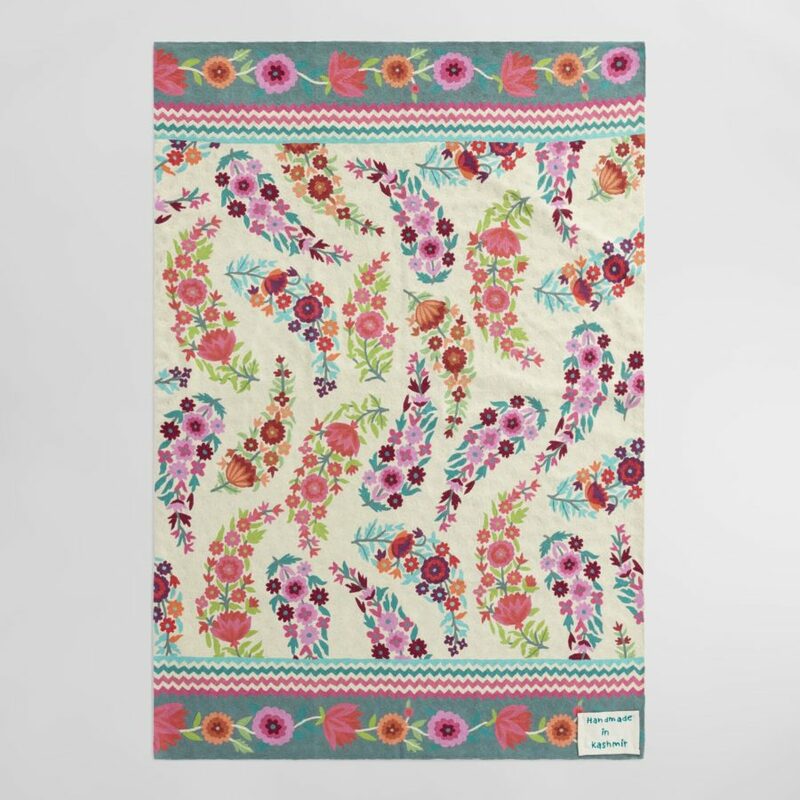 This bandana printed rug is one of the more fun designs of the bunch. It comes in a coral and gray shade as well. But we can’t help but imagine this spread out among the clean flooring inside your kitchen and how beautiful it would open up the space.